This was a fun little project born from a found clock mechanism. That coupled with the need for a clock in my sewing/craft room and a box of colored pencils resulted in this plan. 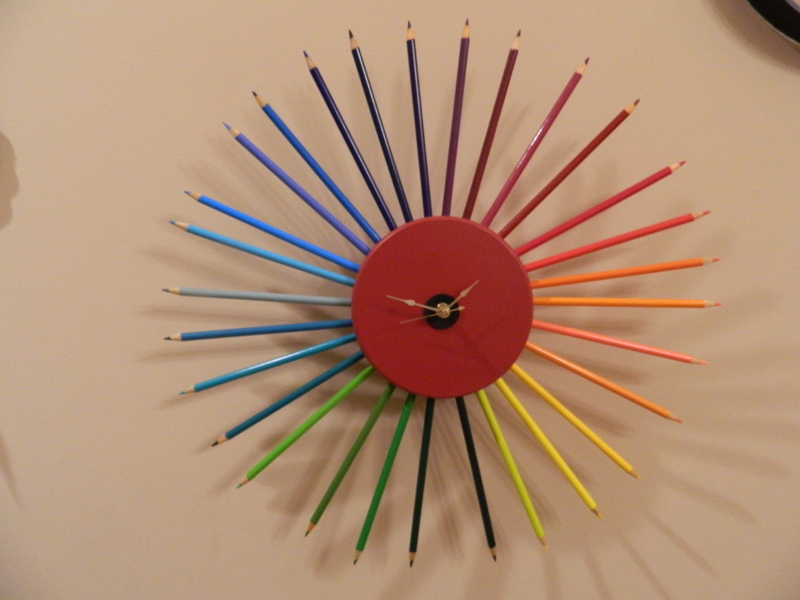 The only real challenge was finding something to use as a clock face that would allow me to connect the pencils. Wandering the aisles of Jo-Ann’s, the Kid actually made the discover of a small round wooden box with a lid. Having the box actually hides the clock mechanism. 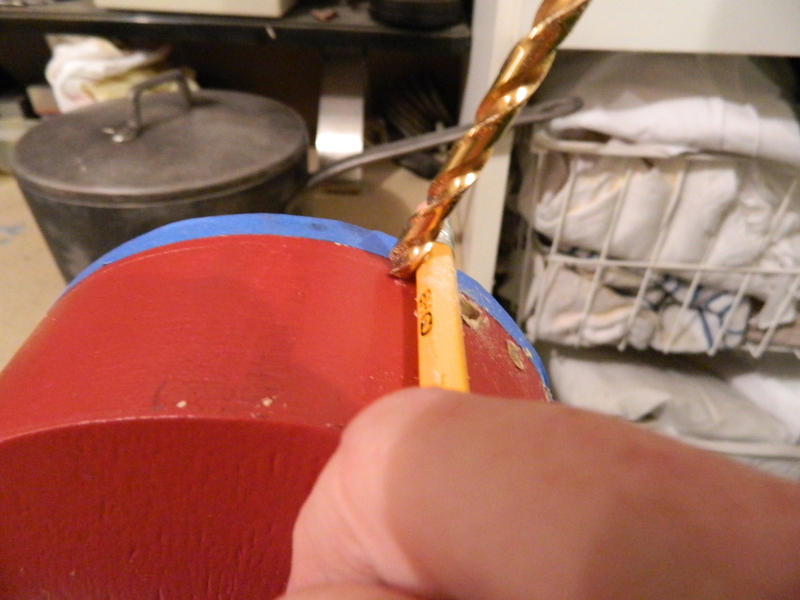 I was able to drill holes around the outside edge just below where the lid would rest. I marked it with blue painter’s tape and then drilled each hole using a pencil as a spacer. I drilled the holes just slightly smaller than the diameter of the pencil which made them sit nice and snug without any gluing required. I am really happy with the way this turned out, I love the arrangement of the color graduations. I had seen this idea in another blog, apologies to the blogger, I cannot remember who or where I saw it (or I would give you credit). I just remember liking the idea a lot. When I was wandering the aisles at Jo-Ann’s, I noticed a great sale on the double curled stakes and invested in three. Then I rummaged through my china collections and found six cup & saucer combinations. I had previously collected a bunch of cup & saucer sets when I was collecting my Grandmothers’ china sets. Beautiful patterns and colors that caught my eye. The rest was easy, just laying the cups on their sides onto the saucers and gluing (using my trusty E-6000 glue). Twenty four hours later and they were ready to plant in the yard. 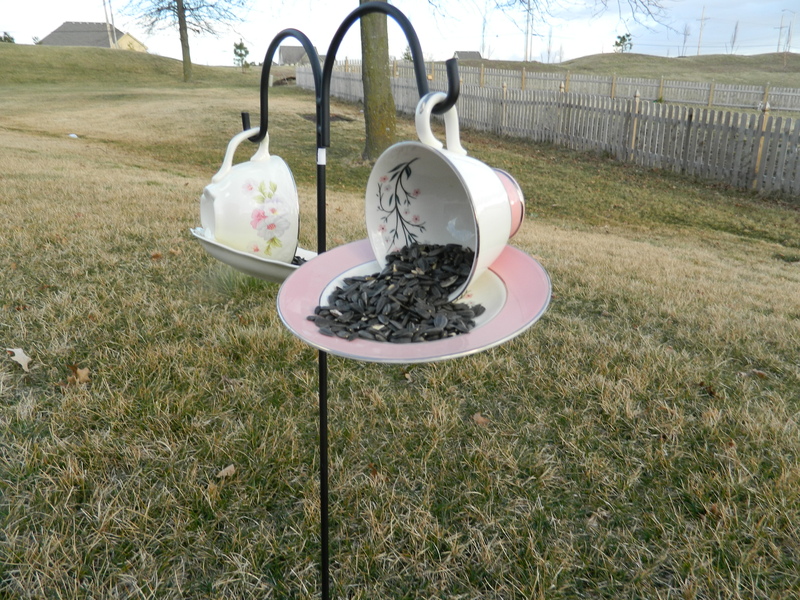 I put one on either side of my back yard and filled them with sunflower seeds. One set was reserved for the courtyard at work where I sometimes have lunch. 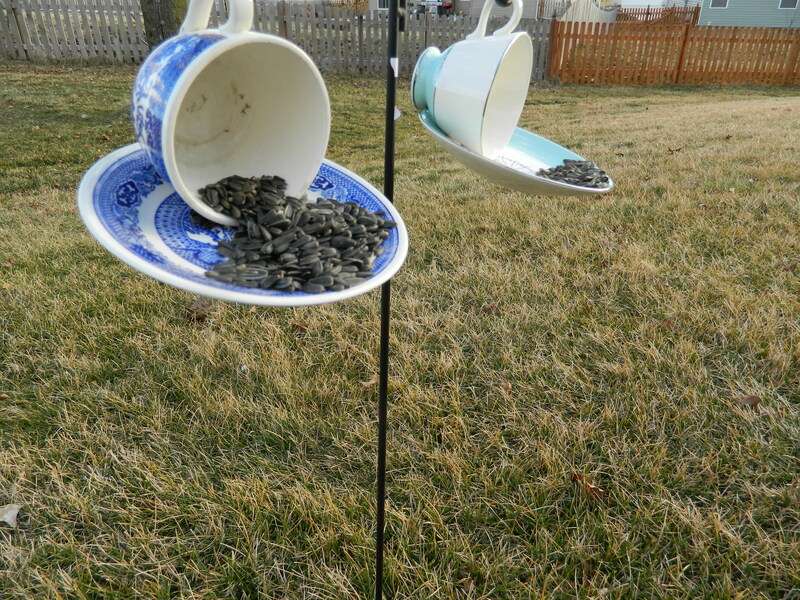 I thought it would be fun to see the birds feeding. So, that is a quick update. I have several more projects in the works that I hope to post soon.